Our group has this weird track record with the upper Callaghan. We’ve been out there three times now, and somehow have barely managed a downhill turn. The first time was the physics-defying Telemagique tour, which only went up; the second time we underestimated how long it would take to get to the lodge and had to turn around immediately after we arrived; most recently, a freezing level bounce had left everything below 3,000m completely unskiable. When we set out for Journeyman today, we weren’t hopeful – could we finally break the jinx that had taken us through 88km of pointless slogging? C and I took a cat bump to Callaghan Lake, then hot-footed it to the lodge as fast as we could. We were unable to resist the temptation to stop for a hot chocolate and a real bathroom (how can you not, when these things present themselves deep in the backcountry?) but we still had plenty of time to climb the additional 750 vertical metres behind the lodge to Journeyman peak. Last time I visited the lodge I wasn’t skiing, but one sunny morning had given me a glimpse of the limitless terrain that surrounded it. As we climbed higher, I realised that the views from the valley floor had barely touched on the potential of this zone. Hidden, Callaghan, Ring, Solitude – towering peaks and endless fall line surrounded us in every direction. 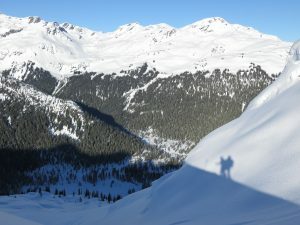 We transitioned just below the true peak, and prepared for an epic run back to the valley. 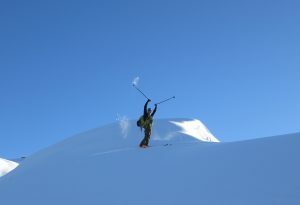 But to my surprise, when I pushed off the first roll my skis barely moved – it was as though I still had skins on. My first thought was that the curse of the Callaghan had struck again, and I’d suffered some epic wax crisis that was going to doom my downhill turns. But then I discovered a thin layer of ice on the base of my skis that was easily removed with a credit card, and the fun really began. 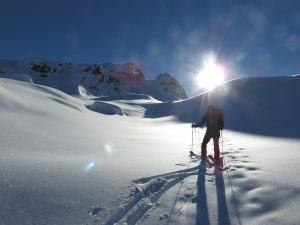 We skied back down the north-west aspect we’d climbed, which gave us nearly 2km of skiing and 750m of vertical descent through smooth, silky alpine bowls and then through deep powder in steep trees. It was the run of the winter for sure, and we were laughing for joy as we tumbled out of the trees and back onto the valley floor. It’s a long ways out from Journeyman to Alexander Falls, but at least the XC trails make it easy. And after finally breaking the curse of the Callaghan, we were grinning all the way. 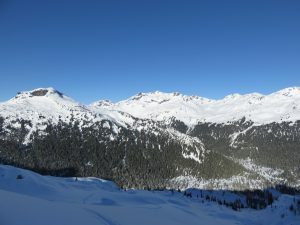 This entry was posted in Backcountry, Callaghan, Skiing on January 9, 2016 by Kay.